Therefore, to celebrate a landmark birthday: ten of my favourite Dilip Kumar songs, from films that I’ve seen. 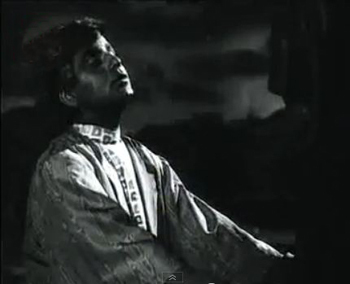 To make life a little easier for myself, I’ve restricted myself to just the solos (or, in some cases, solos with a chorus) that were picturised on Dilip Kumar. 1. Madhuban mein Radhika naache re (Kohinoor, 1960): The songs in this list aren’t in any particular order—except for this one. Madhuban mein Radhika naache re is my absolute favourite Dilip Kumar song (it also happens to be one of my favourite Mohammad Rafi songs). 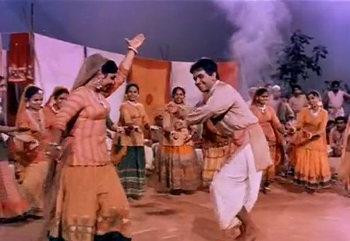 Kumkum’s dancing is superb, the music is fabulous—and Dilip Kumar provides a fine example of what an actor lip-synching to a song can do. Not only is he a very believable ‘singer’, he also plays the sitar—he apparently insisted on taking some weeks to learn how to play it, so that it would look authentic onscreen. Now that’s what I call dedication. 2. Aaj ki raat mere dil ki salaami le le (Ram aur Shyam, 1967): From the superhit film that was to spawn Seeta aur Geeta and other films about identical twins who are separated as infants, and accidentally change places as adults—a superhit song. I had a tough time choosing this one, because I also like Aayi hain bahaarein, mite zulm-o-sitam, a cheery song if ever there was one. But this melodious and sad paean to an about-to-be-lost love is just that notch higher, because of its focus on varying emotions. 3. O door ke musaafir humko bhi saath le le (Udan Khatola, 1955): Another song of a soon-to-be-lost beloved, but so much sadder than Aaj ki raat mere dil ke salaami le le. Because here, it’s not as if the sweetheart is on the brink of marrying another; it is far more hopeless—because she is being sacrificed, literally being sent to her death. 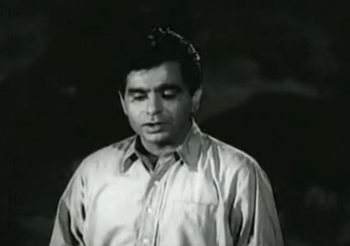 The lyrics—“Chaaron taraf lage hain barbaadiyon ke mele re”—are touching, but the desperate pleading in Dilip Kumar’s face says it all, really. 4. 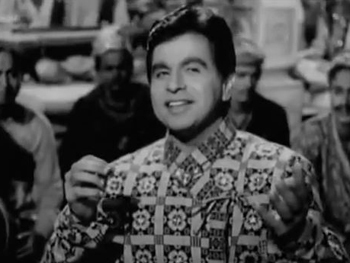 Nain lad jayee hain toh mannwa maan (Ganga Jamuna, 1961): For a change, a cheerful, flirtatiously rural song—and Dilip Kumar shows he can shake a leg with the best of them. He prances about, matches steps with the ‘village girls’, and outright declares his love for the beautiful girl who’s standing by, watching shyly. This one ranks right up there with Yeh desh hai veer jawaanon ka as one of Dilip Kumar’s best folksy songs. 5. Dil mein chhupaake pyaar ka (Aan, 1951): Most of us who love old Hindi films would associate this situation—using a disguise to kidnap a young lady (a princess, no less!) in her own vehicle—with someone like Dev Anand, Shammi Kapoor, or Joy Mukherjee. 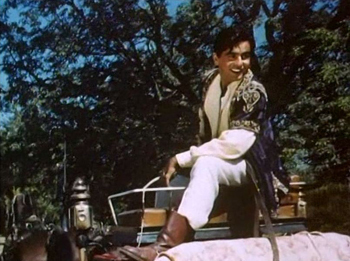 But Dilip Kumar did it well before them, in this delightful ghoda-gaadi song. And how very handsome he looks, too: completely irresistible. 6. Yeh mera deewaanapan hai (Yahudi, 1958): Another romantic song, but an angst-ridden one, which teeters on the edge of despair. 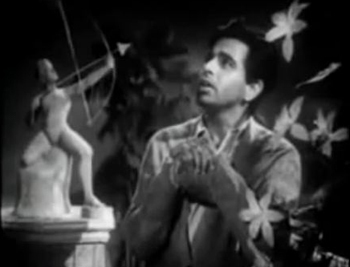 Dilip Kumar, as the high-born Roman in love with a Jewish girl, waits for her with rapidly diminishing hope. She will not come, he thinks. And someday, in these ruins, he too will suffocate and die of despair. Then, no matter how much she calls, he will not come. An emotional and touching song, and beautifully sung by Mukesh. 7. Toote hue khwaabon ne (Madhumati, 1958): I was caught between two Dilip Kumar songs from Madhumati: Suhaana safar aur yeh mausam haseen, and this one. While Suhaana safar is a very pleasant song (and that echo effect is wonderful! ), Toote hue khwaabon ne wins simply because of its depth of feeling: the sense of utter loss that is echoed in Dilip Kumar’s face—without being hammy or quivery-lipped. A good example of restraint. 8. 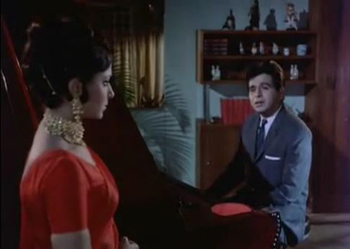 Aaj puraani raahon se (Aadmi, 1968): While I’m not particularly fond of either Aadmi or Dilip Kumar’s role in it (his character is a rather unlikeable sort), this song is a favourite of mine. Somewhat bitter, cynical, lonely—and yet, in sight of the light at the end of the tunnel. A man who’s been through the troughs, caused by his own selfishness—and has come out of it a better man. 9. Koi nahin mera is duniya mein (Daag, 1952): Another film with lovely songs (Ae mere dil kahin aur chal, in its varied versions, is another wonderful song). This one, speaking of loneliness and distress, is similar in tone to the three previous songs: bogged down by tragedy, deserted by those he loves, the hero sings to himself. And it’s another example of how Dilip Kumar managed to lip-synch to such unhappy songs without appearing overly melodramatic. 10. Bachpan ke din bhulaa na dena (Deedar, 1951): The joyful children’s version (with Tabassum and Parikshit Sahni) of this song is the better-known one, but the one important reason to like the Dilip Kumar version is that he is in it. It’s a short song, but the expressions that pass over his face as he sings are wonderful: the fleeting glimpse of joy from a long-ago memory; the sudden sorrow of realising that the rosy future he had hoped for has gone; the growing distress. Happy birthday, Dilip Sahib! May you and your films live long. Dilip was a great actor and lucky to have worked in an era when some of our BEST films were being made. These films had songs that were the best of all times too. Hence, it is hard to DISLIKE any Dilip song. @Ava : Jaise ki Aye gham-e-dil kya karoon? haan :) PKK vasion ko sab maloom hai. True. I can’t think of any Dilip Kumar song that I actively dislike. He did have a lot of wonderful songs picturised on him – both solos as well as duets. DO, I was totally in the Talat-Dilip zone yesterday when I read your post. But you are right, all these singers’ voice suited Dilip. Or rather, he was such a good actor that he had no problem in adapting to various playback singers. Yes, a lot of the credit must go to Dilip Kumar – he was able to adapt himself very easily to different singers. (Though, to be fair, in Kitna haseen hai mausam, Chitalkar is making a definite attempt to copy Talat). He is copying Talat for if memory serves me right Talat Mehmood was supposed to sing this song but was unable to spare the dates or something like that so C.R.Ramchandra did the next best thing he imitated Talat Mehmood. Yes, I know. C Ramachandra was actually pretty good at adapting his voice. For a long time before I discovered that he sang this song, I actually assumed it was Talat. Happy Birthday Dilip Saab – Tum jeo hazaron saal, saal ke din hon pachas hazar. 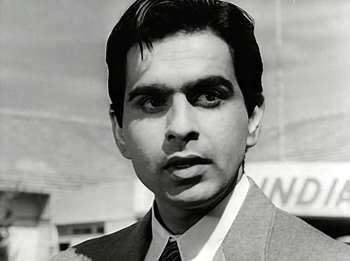 A very Happy Birthday to Dilip Kumar! I like Rafi’s Koi saagar dil ko behlaata nahin a lot too. And, although I have watched neither Dil Diya Dard Liya nor Taraana, I love both the songs you’ve listed from them! From your list, I haven’t seen Udan Khatola or Deedar (have been meaning to but haven’t got around to seeing them). And I remember seeing Daag and Yahudi when I was in high school – I don’t remember a thing about them now. Having said that, I love “ye mera deewanapan hai” and “O door ke musafir”. And I’m glad you picked “toote hue khwabon ne” instead of “suhana safar” – definitely showcases Dilip better. In fact the songs you’ve picked all showcase Dilip very well, whether he’s emoting sad emotions or just enjoying himself in a dance (nain lad gayi). There’s another song I like – “sukh ke sab saathi” from Gopi. The movie was so-so, but this was a sweet bhajan, with classic Dilip style in it, I thought. I’ve somehow steered clear of Gopi all these years, but Sukh ke sab saathi dukh mein na koi is a lovely song. Very true words. I liked Gopi Raja. I saw it when I was 11 or so, and thoroughly enjoyed it. There was another fun song in there – something that went , “London se aaya me banthan ke”. Sorry, Am in office so can’t hunt for the song or its exact words. I think I’ll watch Gopi. :-D Had been avoiding it, though I loved his Sagina. Haven’t really watched his later films. Same here. I haven’t watched any of his later films, either. I think Aadmi was probably the latest of his films as a hero that I’ve seen. Out of your post, my favourite is also Madhuban mein Radhika naache re. Followed by O door ke musafir, Toote hue khwaabon ne and Nain lad jaii hain. What would I add to your fine choices? Thank you, Madhu. Happy Birthday, Dilipsaab. No, it doesn’t surprise me at all, Anu! Our likes and dislikes often (not always, thank goodness) are too similar, no? Yeh hawa yeh raat yeh chaandni and Shaam-e-gham ki kasam are two of my favourite Dilip Kumar songs too, but since I’ve seen neither film (though I have Sangdil lying on my desk, waiting to be watched)… I couldn’t include either of them. I don’t suppose, after that, any woman worth her salt is going to want to anything other than strangle him. Hindi film heroines, unfortunately, will fall in love. Sigh. Call me shallow, but he’s too handsome to strangle! I agree with Pacifist here – not even after Amar and Aadmi! :) I guess I wouldn’t either, but it is unfortunate isn’t it, that a handsome face can get away with things that others less fortunate cannot? For what it’s worth, just having him (as he looked in Aan/Madhumati/Kohinoor/Azaad/, etc., Be still, dear heart) singing of his love for you is enough to forgive him for his highhandedness. Sigh. What does that say about us women? All it says is that he is a good actor! Seriously, though, I admire Pran’s good looks in those movies even when he is being a dastardly villain, so admiring Dilip Kumar even in the movies where he is highhanded towards women speaks of our good taste in looks! Or, actually, Nimmi. Or even the woman who acted as Nadira’s maid. Somehow all the women in the film were very irritating. Well, I don’t know. If he was singing to ME about anything, I would just cling to him and never let go. Who cares about being highhanded! Guess it also says that Dilip Kumar is irresistable! By the way, I watched Andaaz recently, and once I finished it, I webcammed my friend and I was BAWLING. She asked me what was wrong, and I narrated the whole plot to her. And then she asked, “So who are you crying over? The girl, right?” I replied, “NO. I’m crying over Dilip Kumar.” She stared at me and asked again, “So you’re crying over the guy who’s dead and not over the girl who has to spend the rest of her life in jail? !” I nodded, and she sighed and told me, You’re such a girl. I’m replying after having read through bombaynoir’s, pacifist’s, and Lalitha’s comments, all I can say is: yes, I agree wholeheartedly: he’s too handsome to strangle! :-) Yes, he is being high-handed and whatever, but I’ll gladly forgive him for that. Especially in Aan (or all the other films you’ve listed, Anu). Sigh. I don’t blame Nadira’s character for being putty in his hands even when she’s trying so hard not to yield. Yay, Dilip Kumar! Okay, I must admit that I started off not liking him so much, but lately, I think he’s pretty good. He’s handsome, first of all. and I really do have to see some of his films. Besides Mughal-E-Azam. What do you recommend? He’s very handsome in all of these, and the films themselves are fun, not the rather grim stuff like Devdas or Deedar. Happy Birthday Dilip Saheb. May you complete a century and more. And of course the songs you have listed are all great and among my favourites too. Like you, I absolutely love ‘Madhuban mein Radhika’. It’s perfect. The Ganga Jamuna song too. I’ll have to go on saying …too, ….too, so I’d better say something different. What about listing a song not on your list, which I adore. Based on a classic tune, the sitar piece at the beginning and also in the song are soul stirring. This song from Dil Diya Dard Liya. The film Dil Diya Dard Liya was based on Emily Bronté’s Wuthering Heights. Hate that book. The film is more tolerable, and DK of course acts well, as Heathcliff. Which reminds me of his other film adapted from a Bronté book, Jane Eyre by Charlotte Bronté called Sangdil with Madhubala, who’s far from a plain Jane. This song is a sweet cheery one. I like it very much. Yes, I have DO :-) I think all their films together in that period had them sizzling together, though I must say in Mughal e Azam one wouldn’t have guessed they weren’t even on speaking terms with each other. Yes! One would never imagine! That’s what great acting is all about, no? I had no idea Dil Diya Dard Liya was based on Wuthering Heights! I find that book terribly depressing, but I do like one particular British TV adaptation of it. I can imagine Hindi cinema doing a not too faithful version… must look out for this, thank you for the recommendation! And Aan. Mmm. The women are mostly silly and theatrical, but I can watch the film over and over again, simply for Dilip Kumar. The ending was changed in the film – thankfully, and DK’s character isn’t as repulsive as in the book. The film is not a joyous one though. I can understand that no adaptation of Wuthering Heights could ever be a joyous one. I remember, the first time I read the book, I kept waiting for Heathcliff to redeem himself (or for Catherine to redeem herself! ), but no… two completely unlikeable protagonists. I haven’t got around to watching Sangdil yet – must do it soon, now! I’ve heard this song before, but this is the first time I’m watching it. Beautiful. You can see the love between them. Of course this Talat song from the film is more well known and popular. Another Dilip/Talat combination. I forgot to mention that I loved your description of the changing expressions on DK’s face. Something I always note when watching his films. Dilip Kumar’s is one of the most (the most, even?) expressive faces I’ve seen among Hindi film actors. For instance, in that short instant in Bachpan ke din bhulaa na dena, even before he starts singing, you can see just what is going through his character’s mind. Wonderful post, Madhu, and you have chosen all the songs which I love! Yes, I would probably have added the song from Andaz, Hum aaj kahin dil kho baithe … to this list, just for the happiness on his face and the glow of his love! Ah, yes. :-) Lovely song, Lalitha! Thank you for reminding me of this. The sheer joy (and possibly triumph?) on his face is a sight to watch. He looks so proud and happy – and contented. Even though you had a tough competition between two other songs in Madhumati, I like “Dil tarap tarap ke” the most in the film. 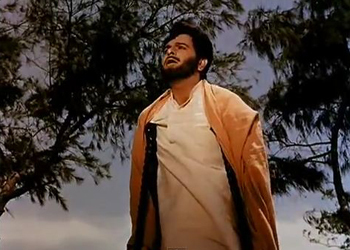 I would go so far to say that it is the only song in the film whose beat and Dilip Kumar’s acting goes with theme. 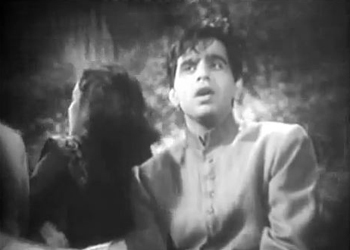 Note: Dilip Kumar had not yet mastered ‘method acting’ in 1958. Also I’d like to add Madhumati has a special meaning to me because it is the only Bollywood film, the great genius, Ritwik Ghatak ever associated with. Much as I like Dil tadap-tadap ke ke raha hai (and I do, a lot! ), it wouldn’t have fitted in my list, because it isn’t a Dilip Kumar solo – it’s a duet. Madhu, very nice list, and as you might know, I most love those songs from Kohinoor and Uran Khatola. And I do think your list should have had something from Andaz! I remember being quite fond of this song from Sagina when I was a kid. Haven’t heard it in ages! Great post, at the right time too. All songs in the post and the comments are excellent. I would only like to add the songs of Mela and Babul. My top favourites being ‘Dharti ko akash pukare’ and ‘Milte hi aankhen dil hua.’ I have a vague memory of ‘Dharti ko akash pukar’ being a longer song than what youtube offers. I recall a stanza in Mukesh’s voice from a movie I had seen on Naushad’s music decades back. Is my memory deceiving me, or is there a longer version somewhere? ‘Nain lad jaihen’ is an all time favourite of mine in the folk genre. Dilip tried something similar with ‘Mere pairon me ghunghroo bandha de to phir meri chaal dekh le’ years later, but I would still rate the earlier song much higher. Actually, neither of these would have fitted my list, because they’re duets, not solos. But great songs, nevertheless. Amongst my favourites are the Aadmi song you listed, songs from Amar(Insaf Ka Yeh Mandir), Yeh Hawa Yeh Raat by Sajjad,Sawan Aaye ya na aaye (DDDL) and “Tan Ranglo Ji” from Kohinoor. (it is a great Holi song, beautifully picturized).Of course “EK Shehenshaah ne banwake”from Leader. Loved reading all the comments here – the love for Dilip Kumar is very evident. Just remembered another Dilip movie – Dastaan (1972). I remember this movie being released. It was quite eagerly awaited – seeing as it was BR Chopra with Dilip Kumar, not to mention a Dilip-Sharmila pairing. So, a somewhat new combo. The movie didn’t do well at the box-office, as far as I can remember. There was one famous song though – Na tu zameen ke liye (one of Rafi saab’s hits during that period dominated by Kishore). The movie is a remake of Afsana (the Ashok Kumar-Veena film). I haven’t seen Afsana but I remember Greta mentioning once that she preferred Afsana to Dastaan. Be that as it may, I didn’t mind Dastaan at all. Have you seen it? If not, maybe a one-time watch? I’ve seen Afsana (which I thought so-so – but then, I’d seen it a long time back, and my tastes have changed a bit since). Haven’t seen Dastaan, though I remember hearing this song. Btw, I just want to say that imdb has got Gopi tagged as 1973. That’s misleading – it acknowledges that this is the “Turkey release”. Elsewhere one can see it as a 1970 release – and it definitely feels more like a late-60s typical movie than a 70s film. Too true – they don’t make them like that any more! I have mentioned somewhere I like Dilip Saab’s b/w songs more than the color ones , this list actually contains my favourite color songs of him. ‘Aaj purani raahon mein’ specially. Ek main hoon ek meri bekasi ki shaam hai is another gorgeous one (Ava would echo me, I’m sure – Dilip Kumar + Talat = unbeatable combination!) Again, I am ashamed to admit I’ve not seen Taraana yet. Ae dil mujhe aisi jagah le chal is good too; the Insaniyat song I don’t remember having heard before. These songs are such good examples of Dilip Kumar proving he could act the buffoon or be light-hearted and playful, not necessarily always the grim or tragic figure. “Koie Pyar Ki Dekhey Jadugaree…..” sung by Lata & Rafi in the Movie Kohinoor. In this particular song they seem to be very much in love, very happy, laughing and the scenery, everything is just Wow! It is very rare that we can see them like this. Dilip was never one of my favorites, and I used to think of him as an overrated actor. This gradually changed after I saw Shakti (I kinow Anu is going to shoot me for this), I think he was much better than Amitabh. I used to be a die-hard AB fan in the early 80’s, but I still remember watching Shakti in a theatre and reluctantly agreeing with the general consesus in AB’s home territory Bombay — “Yeh Amiitabh Ka Baap Nikla”. I became a fan of Dev during his solid run in the early 70’s, and also getting the “evergreen” title. A lot has been written about “evergreen” 70’s Dev and how he was the only one from the 50’s to have survived the Rajesh-Dharam-Amitabh era. I also remember as to how Dilip had been eclipsed in the 70’s, with duds like Gopi, Sagina, Dastaan etc. However, the early 80’s saw Dilip making a comeback; and looking back I have to say that he was one lasting memory of those times. His performances in Shakti & Vidhataa, both BWood masala movies, were probably the best of that era. Two of my favorite HWod male performances are Marlon Brando in “The Godfather” & Daniel Day Lewis in “There Will Be Blood”; and one of the only actors who I think can stand upto them in a BWood context is Dilip Kumar (Incidentally, the other is Kamalhasan). Happy Birthday to DilipKumar, and thanks for a wonderful post.!!! 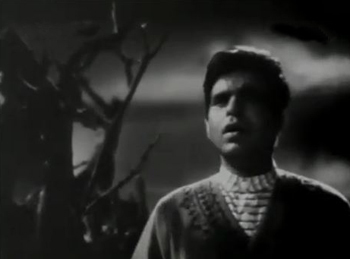 Dilip Kumar is like that too… he can be simply mesmerising. …Dustedoff… oh my God… I am dead… oh God. Dilip Kumar’s films where he had had (so called) कांटेकी टक्कर with a next-in-line) male co-artist – with Raaj Kumar – Paigam and Saudagar, Sanjeev Kumar -Sungursh, Raj Kapoor – Andaz or his deliberately chosen light-roles films certainly brought out (obviously) not-much-seen theatrical qualities and do have remained milestones of his “treagedy-king” crowned career. It may be a trifle too difficult to list out ten really (as good as his pathos songs) light solos, but for that obviously he can not be held responsible. It is for the director to create such a situation and then music director to pick up the challenge. But great he was ( or is) and as Amitabh Bachchan always comments when a comparision comes up, Hindi Film history will alays be talked in two periods – Before-Dilip Kumar and After-Dilip Kumar. Very well put! I like the point you make about his really good light-hearted songs perhaps being not as memorable as his more poignant ones. Despite the fact that there are some joyful songs in my list, and in the comments people have posted, somehow the majority of them can’t match the more heartrending songs. I was so happy to read this article! I, too, love watching DK play the swashbuckling hero. I enjoy ‘Aan’, and enjoy watching him in it. It makes me regret I didn’t live 60 years ago. Incidentally, just the other day, I was reading that Aan was a huge flop in India, but did extremely well overseas – especially in the UK, where it ran for 12 consecutive weeks at a cinema in London. It was even dubbed in Japanese, later. Congratulations Madhu on the acocmplished task of listing 10 fav Dilip Kumar songs! Must have been a hard, though pleasant one. I was sure Madhuban me radhika would find a place here! Love his attire in that song! What is it called? Though I love how Rafi renders o door ke musafir, I wish he had toned down the le le ham reh gaye akele. Teh drawl makes it pretty unattractive for me, but many people love the song exactly for that! nain lad jayee hain toh mannwa maan is also oneof my favs. It is such a fun-filled song wih the right amount of froth in it, without sounding put on! I think I would have chosen maan mera ehsaan rather than dil mein chhupaake pyaar ka. But both are good! Love, love yeh mera deewaanapan hai! It sounds to be such a haunting, tragic song, though it a serenading one! I also would have toote hue khwaabon ne over suhaana safar aur yeh mausam haseen. It is so Dilip Kumar-like! No comments on aaj purani raahon se. As a child I used to think that bachpan ke din bhulana dena means don’t give me upma on my birthday. Why? That is a bit complicated. The word bhula sounds a bit like the word for upma in Konkani. And it sounded very reasonable, upma is for everyday, on birhtday one would expect something special! LOL. I don’t usually comment, though I follow the lot of you quite regularly. This one had me falling off my chair! It fits so perfectly… upma CANNOT, but cannot be birthday food. I also like upma, but if I have a choice between dosa and upma, I would rather have the former, particularly on my birthday! I would opt for dosa as well, if I had to choose between the two. Wow, I’ve haven’t heard a single one of these songs, or watched any of the films – thanks for giving me plenty to catch up on! I am quite surprised that no one at all has mentioned Naya Daur or its songs. A search of the page reveals not one mention of the film at all, which comes a shock to me, I love the film and its songs. I would have recommended it to bombaynoir as one of those lighter Dilip Kumar films you were talking about. Naya Daur may not have been mentioned, Stuart (and I didn’t mention it, because it doesn’t have any Dilip Kumar solos, as far as I can remember), but there’s a reference to a song from it. I’ve mentioned (and linked to) Yeh desh hai veer jawaanon ka in the post. True, Naya Daur could be listed as one of Dilip Kumar’s lighter roles – not as much fun as Kohinoor or Azaad, but still, at least not downright depressing. Dilip Kumar was a very stylish actor, but he is called a natural actor, methodical actor. For me he had a very distinct style of his own which he delivered with perfection. He also did not repeat himself much as Dev Anand did. The only natural actors for me were Ashok Kumar and Balraj Sahni. Dilip Kumar was successful in establishing himself as an actor’s actor that ‘s why almost all actors who joined the industry in 60s and till date swear by him be it Dharmendra, Amitabh Bachchan or others. Recently two actors Irrfan Khan and Nawazuddin Siddiqui in my opinion are matchless but as I have mentioned earlier they do not follow any particular style and do not have the looks of Dilip Kumar. I also consider Naseeruddin Shah a great actor. I agree with you about all the actors you’ve mentioned – including the newer ones.